This article is about neural development in all types of animals, including humans. For information specific to the human nervous system, see Development of the nervous system in humans. Neural development refers to the processes that generate, shape, and reshape the nervous system of animals, from the earliest stages of embryogenesis to adulthood. The field of neural development draws on both neuroscience and developmental biology to describe and provide insight into the cellular and molecular mechanisms by which complex nervous systems develop, from the nematode and fruit fly to mammals. Defects in neural development can lead to malformations and a wide variety of sensory, motor, and cognitive impairments, including holoprosencephaly and other neurological disorders such as Rett syndrome, Down syndrome and intellectual disability. 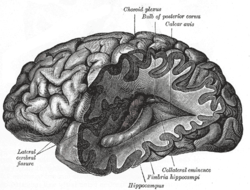 The mammalian central nervous system (CNS) is derived from the ectoderm—the outermost tissue layer—of the embryo. In the third week of human development the neuroectoderm appears and forms the neural plate along the dorsal side of the embryo. The neural plate is the source of the majority of neurons and glial cells of the CNS. A groove forms along the long axis of the neural plate and, by week four of development, the neural plate wraps in on itself to give rise to the neural tube, which is filled with cerebrospinal fluid (CSF). As the embryo develops, the anterior part of the neural tube forms a series of bulges called vesicles, which become the primary anatomical regions of the brain: the forebrain (prosencephalon), midbrain (mesencephalon), and hindbrain (rhombencephalon). These simple, early vesicles enlarge and further divide into the telencephalon (future cerebral cortex and basal ganglia), diencephalon (future thalamus and hypothalamus), mesencephalon (future colliculi), metencephalon (future pons and cerebellum), and myelencephalon (future medulla). The CSF-filled central chamber is continuous from the telencephalon to the spinal cord, and constitutes the developing ventricular system of the CNS. Because the neural tube gives rise to the brain and spinal cord any mutations at this stage in development can lead to lethal deformities like anencephaly or lifelong disabilities like spina bifida. During this time, the walls of the neural tube contain neural stem cells, which drive brain growth as they divide many times. Gradually some of the cells stop dividing and differentiate into neurons and glial cells, which are the main cellular components of the CNS. The newly generated neurons migrate to different parts of the developing brain to self-organize into different brain structures. Once the neurons have reached their regional positions, they extend axons and dendrites, which allow them to communicate with other neurons via synapses. Synaptic communication between neurons leads to the establishment of functional neural circuits that mediate sensory and motor processing, and underlie behavior. Developmental neuroscience uses a variety of animal models including mice Mus musculus, the fruit fly Drosophila melanogaster, the zebrafish Danio rerio, Xenopus laevis tadpoles and the worm Caenorhabditis elegans, among others. The neural plate folds outwards during the third week of gestation to form the neural groove. Beginning in the future neck region, the neural folds of this groove close to create the neural tube. The formation of the neural tube from the ectoderm is called neurulation. The ventral part of the neural tube is called the basal plate; the dorsal part is called the alar plate. The hollow interior is called the neural canal. By the end of the fourth week of gestation, the open ends of the neural tube, called the neuropores, close off. The optical vesicle (which eventually become the optic nerve, retina and iris) forms at the basal plate of the prosencephalon. The alar plate of the prosencephalon expands to form the cerebral hemispheres (the telencephalon) whilst its basal plate becomes the diencephalon. Finally, the optic vesicle grows to form an optic outgrowth. The ventral neural tube is patterned by Sonic Hedgehog (Shh) from the notochord, which acts as the inducing tissue. Notochord-derived Shh signals to the floor plate, and induces Shh expression in the floor plate. Floor plate-derived Shh subsequently signals to other cells in the neural tube, and is essential for proper specification of ventral neuron progenitor domains. Loss of Shh from the notochord and/or floor plate prevents proper specification of these progenitor domains. Shh binds Patched1, relieving Patched-mediated inhibition of Smoothened, leading to activation of Gli family of transcription factors (Gli1, Gli2, and Gli3) transcription factors. In this context Shh acts as a morphogen - it induces cell differentiation dependent on its concentration. At low concentrations it forms ventral interneurones, at higher concentrations it induces motor neuron development, and at highest concentrations it induces floor plate differentiation. Failure of Shh-modulated differentiation causes holoprosencephaly. 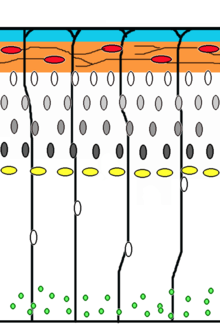 The dorsal neural tube is patterned by BMPs from the epidermal ectoderm flanking the neural plate. These induce sensory interneurones by activating Sr/Thr kinases and altering SMAD transcription factor levels. Signals that control anteroposterior neural development include FGF and retinoic acid, which act in the hindbrain and spinal cord. The hindbrain, for example, is patterned by Hox genes, which are expressed in overlapping domains along the anteroposterior axis under the control of retinoic acid. The 3' genes in the Hox cluster are induced by retinoic acid in the hindbrain, whereas the 5' Hox genes are not induced by retinoic acid and are expressed more posteriorly in the spinal cord. Hoxb-1 is expressed in rhombomere 4 and gives rise to the facial nerve. Without this Hoxb-1 expression, a nerve similar to the trigeminal nerve arises. The processes of neuronal migration, differentiation and axon guidance are generally believed to be activity-independent mechanisms and rely on hard-wired genetic programs in the neurons themselves. New research findings however have implicated a role for activity-dependent mechanisms in mediating some aspects of the aforementioned processes such as the rate of neuronal migration, aspects of neuronal differentiation and axon pathfinding. Activity-dependent mechanisms influence neural circuit development and are crucial for laying out early connectivity maps and the continued refinement of synapses which occurs during development. There are two distinct types of neural activity we observe in developing circuits -early spontaneous activity and sensory-evoked activity. Spontaneous activity occurs early during neural circuit development even when sensory input is absent and is observed in many systems such as the developing visual system,auditory system,motor system,hippocampus,cerebellum and neocortex. ↑ "Neural Tube Defects". Retrieved 6 December 2011. ↑ Saladin, Kenneth (2011). Anatomy & Physiology The Unity of Form and Function. New York: McGraw Hill. p. 514. ISBN 9780073378251. ↑ Croteau-Chonka, Elise C.; Dean, Douglas C., III; Remer, Justin; Dirks, Holly; O'Muircheartaigh, Jonathan; Deoni, Sean C.L. (15 October 2015). "Examining the relationships between cortical maturation and white matter myelination throughout early childhoold". NeuroImage. 125: 413–421. doi:10.1016/j.neuroimage.2015.10.038. Retrieved 21 July 2016. ↑ Estomih Mtui; Gregory Gruener (2006). Clinical Neuroanatomy and Neuroscience. Philadelphia: Saunders. p. 1. ISBN 1-4160-3445-5. ↑ Chambers, S. M.; Fasano, C. A.; Papapetrou, E. P.; Tomishima, M.; Sadelain, M.; Studer, L. (2009). "Highly efficient neural conversion of human ES and iPS cells by dual inhibition of SMAD signaling". Nature Biotechnology. 27 (3): 275–280. doi:10.1038/nbt.1529. PMC 2756723 . PMID 19252484. ↑ Jessell, Thomas M.; Kandel, Eric R.; Schwartz, James H. (2000). "Chapter 55". Principles of neural science (4th ed.). New York: McGraw-Hill. ISBN 0838577016. 1 2 Nadarajah B, Brunstrom J, Grutzendler J, Wong R, Pearlman A (2001). "Two modes of radial migration in early development of the cerebral cortex". Nat Neurosci. 4 (2): 143–50. doi:10.1038/83967. PMID 11175874. ↑ Samuels B, Tsai L (2004). "Nucleokinesis illuminated". Nat Neurosci. 7 (11): 1169–70. doi:10.1038/nn1104-1169. PMID 15508010. ↑ Rakic, P (May 1972). "Mode of cell migration to the superficial layers of fetal monkey neocortex.". The Journal of comparative neurology. 145 (1): 61–83. PMID 4624784. ↑ Noctor, SC; Flint, AC; Weissman, TA; Dammerman, RS; Kriegstein, AR (8 February 2001). "Neurons derived from radial glial cells establish radial units in neocortex.". Nature. 409 (6821): 714–20. PMID 11217860. ↑ Tamamaki N, Nakamura K, Okamoto K, Kaneko T (September 2001). "Radial glia is a progenitor of neocortical neurons in the developing cerebral cortex". Neurosci. Res. 41 (1): 51–60. doi:10.1016/S0168-0102(01)00259-0. PMID 11535293. ↑ Miyata T, Kawaguchi A, Okano H, Ogawa M (September 2001). "Asymmetric inheritance of radial glial fibers by cortical neurons". Neuron. 31 (5): 727–41. doi:10.1016/S0896-6273(01)00420-2. PMID 11567613. ↑ Nadarajah B, Parnavelas J (2002). "Modes of neuronal migration in the developing cerebral cortex". Nature Reviews Neuroscience. 3 (6): 423–32. doi:10.1038/nrn845. PMID 12042877. ↑ Rakic P (1972). "Mode of cell migration to the superficial layers of fetal monkey neocortex". J Comp Neurol. 145 (1): 61–83. doi:10.1002/cne.901450105. PMID 4624784. ↑ Letinic K, Zoncu R, Rakic P (June 2002). "Origin of GABAergic neurons in the human neocortex". Nature. 417 (6889): 645–9. doi:10.1038/nature00779. PMID 12050665. ↑ Wray S (2010). 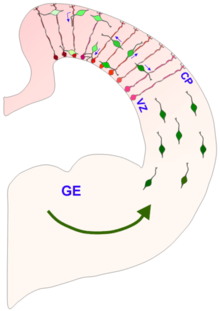 "From nose to brain: development of gonadotrophin-releasing hormone-1 neurones.". J Neuroendocrinol. 22 (7): 743–753. doi:10.1111/j.1365-2826.2010.02034.x. PMC 2919238 . PMID 20646175. ↑ Giacobini P, Messina A, Wray S, Giampietro C, Crepaldi T, Carmeliet P, Fasolo A (2007). "Hepatocyte growth factor acts as a motogen and guidance signal for gonadotropin hormone-releasing hormone-1 neuronal migration.". J Neurosci. 27 (2): 431–445. doi:10.1523/JNEUROSCI.4979-06.2007. PMID 17215404. ↑ Hutchins BI, Klenke U, Wray S (2013). "Calcium release-dependent actin flow in the leading process mediates axophilic migration.". J Neurosci. 33 (28): 11361–71. doi:10.1523/JNEUROSCI.3758-12.2013. PMC 3724331 . PMID 23843509. ↑ Hutchins, B. Ian; Wray, Susan (2014). "Capture of microtubule plus-ends at the actin cortex promotes axophilic neuronal migration by enhancing microtubule tension in the leading process.". Frontiers in Cellular Neuroscience. 8: 400. doi:10.3389/fncel.2014.00400. PMC 4245908 . PMID 25505874. ↑ Parkash J, Cimino I, Ferraris N, Casoni F, Wray S, Cappy H, Prevot V, Giacobini P (2012). "Suppression of β1-integrin in gonadotropin-releasing hormone cells disrupts migration and axonal extension resulting in severe reproductive alterations.". J Neurosci. 32 (47): 16992–7002. doi:10.1523/JNEUROSCI.3057-12.2012. PMID 23175850. 1 2 Tabata H, Nakajima K (5 November 2003). "Multipolar migration: the third mode of radial neuronal migration in the developing cerebral cortex". J Neurosci. 23 (31): 9996–10001. PMID 14602813. ↑ Nadarajah B, Alifragis P, Wong R, Parnavelas J (2003). "Neuronal migration in the developing cerebral cortex: observations based on real-time imaging". Cereb Cortex. 13 (6): 607–11. doi:10.1093/cercor/13.6.607. PMID 12764035. ↑ Komuro, H; Rakic, P (1996). "Intracellular Ca2+ fluctuations modulate the rate of neuronal migration". Neuron. 17: 275–285. doi:10.1016/s0896-6273(00)80159-2. ↑ Gu, X; Olson, E.C; Spitzer, N.C (1994). "Spontaneous neuronal calcium spikes and waves during early differentiation". Journal of Neuroscience. 14 (11): 6325–35. ↑ Hanson, M.G; Milner, L.D; Landmesser, L.T (2008). "Spontaneous early activity in the chick spinal cord influences distinct motor axon pathfinding decisions". Brain Res. Rev. 57: 77–85. doi:10.1016/j.brainresrev.2007.06.021. ↑ Kirkby, L.A; Sack, G.S; Firl, A; Feller, M.B (Dec 4, 2013). "A role for correlated spontaneous activity in the assembly of neural circuits". Neuron. 80: 1129–44. doi:10.1016/j.neuron.2013.10.030. ↑ Huberman, A.D (2007). "Mechanisms of eye-specific visual circuit development". Curr. Opin. Neurobiol. 17: 73–80. doi:10.1016/j.conb.2007.01.005. ↑ Meister, M; Wong, R.O.L; Baylor, D.A; Shatz, C.J (1991). "Synchronous bursts of action potentials in ganglion cells of the developing retina". Science. 252: 939–43. doi:10.1126/science.2035024. ↑ Lippe, W.R (1994). "Rhythmic spontaneous activity in the developing avian auditory system". The Journal of Neuroscience. 14: 1486–95. ↑ Jones, T.A; Jones, S.M; Paggett, K.C (15 October 2001). "Primordial rhythmic bursting in embryonic cochlear ganglion cells". The Journal of Neuroscience. 21 (20): 8129–35. PMID 11588185. ↑ O'Donovan, M.J (1999). "The origin of spontaneous activity in developing networks of the vertebrate nervous system.". Curr. Opin. Neurobiol. 9: 94–104. doi:10.1016/s0959-4388(99)80012-9. ↑ Crepel, V; Aronov, D; Jorquera, I; Represa, A; Ben-Ari, Y; Cossart, R (2007). "A parturition-associated non synaptic coherent activity pattern in the developing hippocampus". Neuron. 54: 105–120. doi:10.1016/j.neuron.2007.03.007. ↑ Watt, A.J; Cuntz, H; Mori, M; Nusser, Z; Sjostrom, P.J; Hausser, M (2009). "Traveling waves in developing cerebellar cortex mediated by assymetrical Purkinje cell connectivity". Nature Neuroscience. 12: 463–73. doi:10.1038/nn.2285. ↑ Corlew, R; Bosma, M.M; Moody, W.J (2004). "Spontaneous synchronous activity in neonatal mouse cortical neurons". Journal of Physiology. 560: 377–390. doi:10.1113/jphysiol.2004.071621. ↑ Feller, M.B (1999). "Spontaneous correlated activity in developing neural circuits". Neuron. 22: 653–56. doi:10.1016/s0896-6273(00)80724-2. ↑ O'Donovan, M.J; Chub, N; Wenner, P (1998). "Mechanisms of spontaneous activity in developing spinal networks". Journal of Neurobiology. 37: 131–45. doi:10.1002/(sici)1097-4695(199810)37:1<131::aid-neu10>3.0.co;2-h.
↑ Stafford, B.K; Sher, A; Litke, A.M; Feldheim, D.A (2009). "Spatio-temporal patterns of retinal waves underlying activity dependent refinement of retinofugal projections". Neuron. 64: 200–212. doi:10.1016/j.neuron.2009.09.021. ↑ Torborg, C.L; Feller, M.B (2005). "Spontaneous patterned retinal activity and the refinement of retinal projections.". Prog. Neurobiol. 76: 213–35. doi:10.1016/j.pneurobio.2005.09.002. ↑ Galli, L; Maffei, L (1988). "Spontaneous impulse activity of rat ganglion cells in prenatal life". Science. 242: 90–91. doi:10.1126/science.3175637. ↑ Ford, K.J; Feller, M.B (2012). "Assembly and disassembly of a retinal cholinergic network". Vis. Neurosci. 29: 61–71. doi:10.1017/s0952523811000216. 1 2 Kirkby`, L.A; Sack, G.S; Firl, A; Feller, M.B (2013). "A role for correlated spontaneous activity in the assembly of neural circuits". Neuron. 80: 1129–44. doi:10.1016/j.neuron.2013.10.030. ↑ Ackman, J.B; Burbridge, T.J; Crair, M.C (2012). "Retinal waves coordinate patterned activity throughout the developing visual system". Nature. 490: 219–25. doi:10.1038/nature11529. 1 2 Kandler, K; Clause, A; Noh, J (2009). "Tonographic reorganization of developing auditory". Nature Neuroscience. 12: 711–17. doi:10.1038/nn.2332. PMC 2780022 . PMID 19471270. ↑ Tritsch, N.X; Rodrigues-Contreras, A; Crins, T.T,H; Wang, H.C; Borst, J.G.G; Bergles, D.E (2010). "Calcium action potentials in hair cells pattern auditory neuron activity before hearing onset". Nature Neuroscience. 13: 1050–52. doi:10.1038/nn.2604. ↑ Momose-Sato, Y; Sato, K (2013). "Large-scale synchronized activity in the embryonic brainstem and spinal cord". Front. Cell Neurosci. 7: 36. doi:10.3389/fncel.2013.00036. ↑ Warp, E; Agarwal, G; Wyart, C; Freidmann, D; Oldfield, C.S; Conner, A; Del Bene, F; Arrenberg, A.B; Baier, H; Isacoff, E (2012). "Emergence of patterned activity in the developing zebrafish spinal cord". Current Biology. 22: 93–102. doi:10.1016/j.cub.2011.12.002. 1 2 Sanes, Dan; Reh, Thomas; Harris, William. Development of the Nervous System (Third Edition). Elsevier.